﻿ Golden Central Hotel Saigon, Ho Chi Minh City | FROM $55 - SAVE ON AGODA! "Location, value and nice staff." 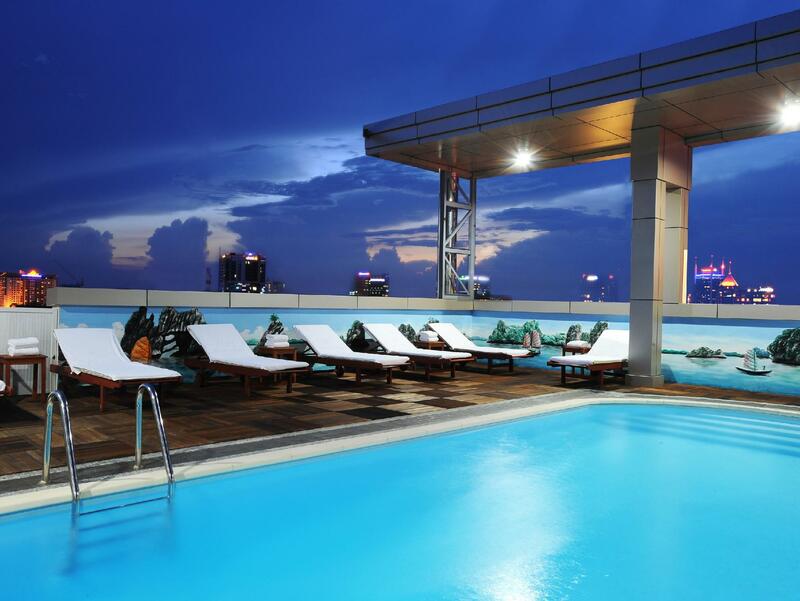 Have a question for Golden Central Hotel Saigon? "Overall this Hotel represents excellent value for money." 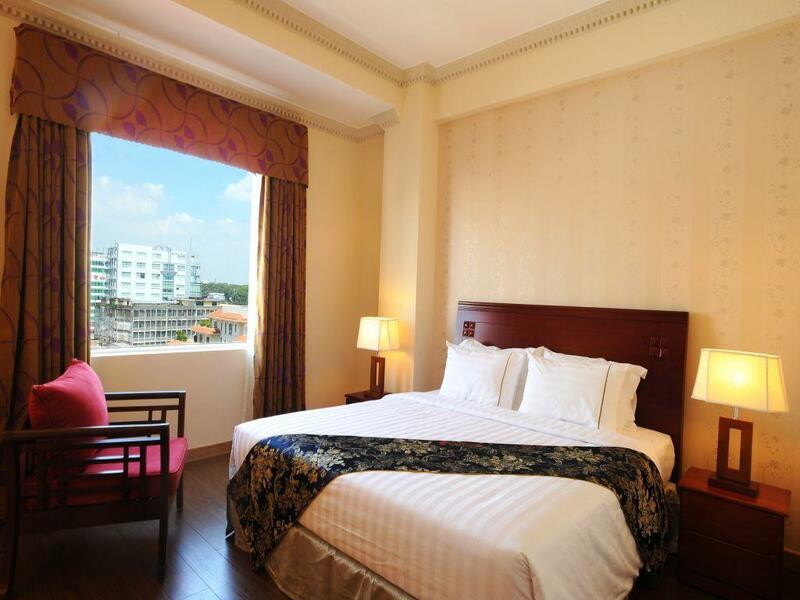 Golden Central Hotel Saigon, located in District 1, Ho Chi Minh City, is a popular choice for travelers. With its location just 50 miles from the city center and 6 km from the airport, this 4-star hotel attracts numerous travelers each year. This modern hotel is in the vicinity of popular city attractions such as Phan's Custom Tailor, Mariamman Hindu temple, Queen Collection. At Golden Central Hotel Saigon, every effort is made to make guests feel comfortable. To do so, the hotel provides the best in services and amenities. A selection of top-class facilities such as 24-hour room service, free Wi-Fi in all rooms, 24-hour security, daily housekeeping, gift/souvenir shop can be enjoyed at the hotel. In addition, all guestrooms feature a variety of comforts. Many rooms even provide television LCD/plasma screen, separate living room, internet access – wireless, internet access – wireless (complimentary), whirlpool bathtub to please the most discerning guest. The hotel offers wonderful recreational facilities such as fitness center, sauna, outdoor pool, spa, massage to make your stay truly unforgettable. 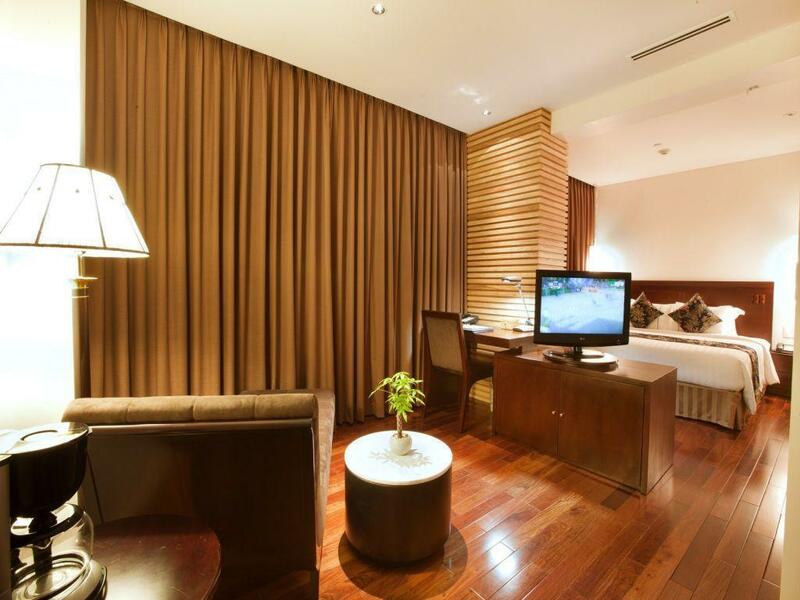 With an ideal location and facilities to match, Golden Central Hotel Saigon hits the spot in many ways. This is the fourth time I have stayed at this hotel. Great location, close to everything that tourists want in HCMC. Breakfast offers a very good variety and the staff are very helpful. Rooms are well kept. Will definitely stay here again if I come back to HCMC. I have choosen for this hotel because there in hochiminh hotels were not room available on that day. I would like to say to people that 'Do not consider this hotel for your sucessful business'. 1. Low water pressure in restroom. therefore i went to out to wash my face and moth briefly. 2. Swimming pool looks like local sauna quality. so that not available for relaxing faitigue. 3. Restaurant is ungainly less menus and taste was amazingly bad in the breakfast meal. you may get starting annoying morning. 4.Hotel staff is not interested in guest and never ever take care of guest opinion. 5. I paid around VND 3,940,000($190) for one night. this amount is suitable for very nice hotel more than here. honestly in my opinion that this hotel must get two-star in agoda review and cost should be under $60. it is too much affected to Agoda reputation getting worse. i got phsical problem due to non-sleep with bad facilities and i got bad business trip experience. It did not meet my expectation. The facilities are very poor with a very old LCD TV, bad toilet stuffs and poor mini bar. The noise from the next door guests was very big at night. And do not expect much for breakfast. Golden Central is a good choice if you are not looking for a five star hotel and want to be in the middle of the busiest tourist district and close to Ben Thanh market. The price and experience match well. Location wise. Clean and cute toilet! 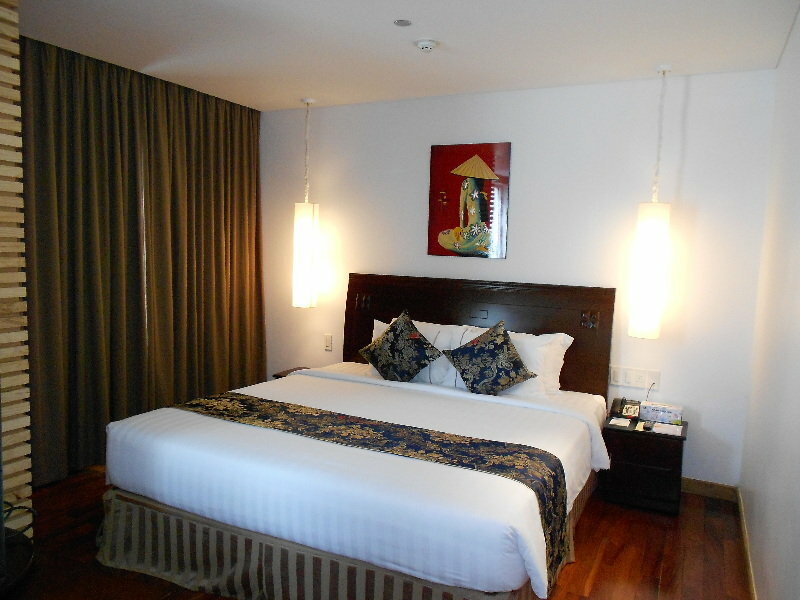 comfortable beds and pillows, helpful and friendly staff, nice view, rooftop pool. Perfect hotel and value for money. Though they didn’t picked us up at the airport when we arrived, I already arranged and emailed them but when we got there they did not give me any message lol. I will still return to this hotel because I feel comfortable here and safe. Location of the hotel is excellent, right in the center of district 1, only one block to Ben Thanh Market. Room is a bit small, but enough for me as I traveled alone this time. Staff is very nice. I got the check in date wrong when I booked the hotel through Agoda, and showed up one day earlier than my scheduled check-in dates. The hotel staff was able to change my date and accommodated me, even though legally they did not have to (or charge me an extra night). It is also nice to have complimentary breakfast. Nothing fancy, but plenty of variety to choose from. During the first day of my breakfast I noticed that one coffee cup was not very clean, and pointed it out to the manager. He thanked me earnestly, and promised that he would personally check it thoroughly in the future. Overall a very good experience. You need to pay more to this hotel if you want to stay with Vietnamese in one room and it doesn’t matter they are male or female you are require to pay more in order to stay in this hotel which to me is nonsense policies. Prior to arrival, I had to resched my reservation to a later date due to some adjustments in the itinerary. Even though it was already non-refundable on Agoda, the hotel allowed me to resched with no extra fees at all, and even offered complimentary 6-in cake for my parents who used the room. The hotel has a rooftop pool with a nice view of the surrounding area as well as the other rooftop bars in the neighborhood. It is a 1 minute walk from Ben Thanh Street Food Market. Talk to the tour operator and concierge in the lobby and book a trip to Vung Tau. Have your driver take you to one of the places where you can buy local seafood and have them cook it for you. The prawns and crabs were amazing and the prices were unbeatable. Good location in City . Handy for mkt and not fat from Times Square . Pool good for a cool down after walking in heat. But very small and cool . Gym equip needed update as old and tired. Great views of City from top restaurant . Room quite small for money . Shower was a unit type with step up frame to get over ! Bit strange . I would stay again 1/2 nt s .
Decent, comfortable hotel, conveniently placed to Ban Thanh Market and food courts, as well as plethora of travel agents to book tours through. Room size just adequate, sound proofing could do with an upgrade as noisy neighbours can be a nuisance, choose to saty away from lifts. Could not figure out the TV. If you are a foreigner and have a Vietnamese woman as your GF she cannot stay with you unless you pay an extra fee. Be aware that this is the law. Close to cinema where we saw 'It'. The Located at central of HCMC district 1, easy to traveling to meet clients, you could find many of the food vendors near by the hotel -- A interesting place to check out and try some traditional foods, and also get some beers and western foods. I enjoyed to stay with free breakfast included which was very good and would recommend it to all. The staff were friendly and informative. Rooms were comfortable, the roof top lounge views were delightful. I would like to give 4.5 stars to all. Stayed there on three occasions during March for four days each time. The staff are fantastic, Thu Bui is a wonderful staff member and so helpful. The front desk staff Vinh, Ngan and Phuong were great and assisted by arranging a late check out for me despite being fully booked. Had a fantastic stay.